Dependant on the individual circumstances we can utilise a wide range of chemical agents to supplement the cleaning process. These chemicals are trade substances chosen for their bio degradable nature and suitability for each substrate. Risk statements are available per job and we are well prepared using PPE safety clothing. From Brick and mortar cleaning to Paint removal, from efflorescence staining to algae retardants we will have a method to suit. 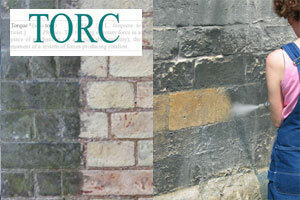 Often a simple Pressure jet wash used in conjuction with a nebulous spray system will remove surface dirts and provide a freshen up of dirty brickwork. This will give a strong cost / finish combination for those in need of a straight forward clean. To Remove: Carbon sulphation, lime & cement based paints & residues, some very old oil based paints, oxidised bitumen, lime scale. (mostly inflexible matter). The TORC system creates a gentle swirling vortex using a mixture of low air pressure, little water and a safe inert fine granulate. The original Jos system which Stonehealth introduced into the UK and other markets over 20 years ago has since been developed into the more effective TORC. The Torc Head has since been modularised into separate components which has resulted in an even more efficient and gentler swirling vortex using even less water and granulate. The removable nozzle cone can easily be changed so that a larger cone can clean larger areas such as ashlar or a smaller nozzle cone for more intricate detail such as an elaborate capital or rustications. Only appropriate Stonehealth Approved granulates should be used so that the substrate is not damaged. To Remove: Many paint coatings certain types of graffiti, bird or vermin fouling, algae, moss, fungi and other biological matter, wax coatings, bitumen oil & grease soiling, dirt & grime, chewing gum, organic contamination stains from lipstick & mascara, some anti graffiti coatings & bird gels, (mostly flexible matter). This is unlike any other steam system. It can genuinely achieve 150℃ at the nozzle end. The operator is able to vary the temperature and pressure to remove either many types of paint or biological matter. The steam/superheated water will not only remove moss, algae, fungi and other biological matter but will also kill off the spores so that there is no need to use a chemical biocide either in the removal or as a protection against further biological activity as re-growth will not return any sooner. When the temperature in the system is high the pressure on the surface being cleaned is very gentle and the volume of water is low. The surface is therefore not saturated and will be dry within minutes.